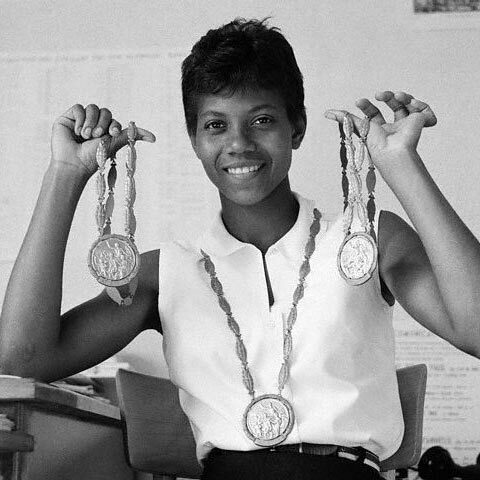 November 12, 1994 Wilma Glodean Rudolph, the first American woman to win three gold medals in track and field during a single Olympic Games, died. Rudolph was born prematurely on June 23, 1940 in Clarksville, Tennessee. Despite a childhood filled with medical problems, she became an accomplished athlete by high school. In high school, she was a basketball star, setting state records for scoring and leading her team to the state championship. At sixteen, she was a member of the United States Olympic track and field team which won a Bronze medal in the 4 x 100 meter relay at the 1956 Melbourne Olympic Games. At the 1960 Rome Olympic Games, Rudolph won Gold medals in the 100 meter race, the 200 meter race, and the 4 x 100 meter relay. In 1960, Rudolph was the United Press Athlete of the Year and Associated Press Woman Athlete of the Year. In 1961, she was the Associated Press Woman Athlete of the Year and won the James E. Sullivan Award as the top amateur athlete in the United States. In 1974, she was inducted into the National Track and Field Hall of Fame, in 1983 into the U. S. Olympic Hall of Fame, and in 1994 into the National Women’s Hall of Fame. In 2004, the United States Postal Service issued a postage stamp in recognition of her accomplishments. The Woman’s Sports Foundation Wilma Rudolph Courage Award is presented annually to a female athlete that exhibits extraordinary courage in her athletic performance, demonstrates the ability to overcome adversity, makes significant contributions to sports and serves as an inspiration and role model to those who face challenges, overcomes them and strives for success at all levels. A life size bronze statue of Rudolph is located in Clarksville.